Glad to have you back for this week's IBM i Pulse! Each week we'll take a deeper look at the latest IBM i and Profound Logic news. This week we are discussing the risks of going off IBM hardware support and highlighting the user profile attributes you should focus on. NodeRun is the newest Profound Logic product dedicated to making it easier for Node.js developers to create applications by moving development to a cloud-based environment. NodeRun comes with a full IDE with Visual Designer, editor, debugger, and Node.js already pre-installed. Some of NodeRun's most notable capabilities include design screens, the ability to develop and run application within the program, full debugging capabilities, the ability to install NPM packages, manage your own Node.js server, work with active sessions to see end-user activity, host database and built-in Database Explorer, a command-line terminal for full control of your space, as well as the ability to share and collaborate with other developers. Getting started with NodeRun is quick and easy. All you need is a modern internet browser (Google Chrome, Mozilla Firefox, etc.) and that's it. Every NodeRun Space is free to build and comes with its own files, database, and server. To get started visit NodeRun.com create an account and begin developing, it's that easy! This 8 part blog series will give you a series of exercises to help you build a Node.js applications that work with employee data. This next exercise will show you how to create an employee listing application with a grid of your employee's records. Glad to have you back for this week's IBM i Pulse! Each week we'll take a deeper look at the latest IBM i and Profound Logic news. This week we are listening to an interview about Open Source and diving into how IBM i shops can incorporate Artificial Intelligence into their businesses. This 8 part blog series will give you a series of exercises to help you build a Node.js applications that work with employee data. This next 2 exercises will show you how use the database-driven auto-complete option and how to add a dynamic image to your display. Glad to have you back for this week's IBM i Pulse! Each week we'll take a deeper look at the latest IBM i and Profound Logic news. This week we are looking at a security patch that is crucial for the IBM i and an article that helps you determine if Cloud hosting is best for your IBM i shop. Getting started with NodeRun is quick. All you need is a modern internet browser (Google Chrome, Mozilla Firefox, etc.) and that's it. Every NodeRun Space is free to build and comes with its own files, database, and server. To get started visit NodeRun.com create an account and begin developing, it's that easy! This 8 part blog series will give you a series of exercises to help you build a Node.js applications that work with employee data. This first exercise will show you how to create an Employee Lookup Module. Glad to have you back for this week's IBM i Pulse! Each week we'll take a deeper look at the latest IBM i and Profound Logic news. This week we are looking at the skills needed (and not needed) to manage an IBM i platform and a recap of the longevity of IBM i. 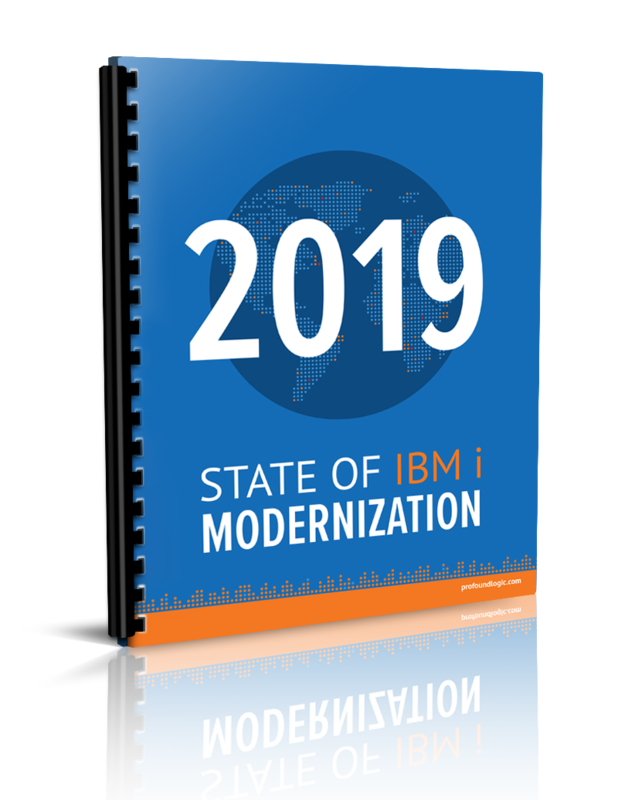 This year's annual 'State of IBM i Modernization' survey focused on three key topics: the current state of the IBM i, the current attitude towards the IBM i, and what the future looks like for the IBM i. Profound Logic reached out to the community with a series of vital questions on these topics and we received nearly 800 responds from developers, executives and everyone in-between. This large scale response resulted in one of our most productive surveys, giving us a wide range of answers. Traditionally, the negative view of the IBM i has been a roadblock for future development and modernization. This survey proves that that attitude is shifting, with more businesses having more confidence in the platform than in the past. Concerns are still present - a diminishing developer pool and outdated interfaces for example - but none that can't easily be addressed to ensure a long and healthy future for the IBM i business. This three-part blog series will dive into the key topics discussed within the survey: This week we discuss the Future of the IBM i.
Glad to have you back for this week's IBM i Pulse! Each week we'll take a deeper look at the latest IBM i and Profound Logic news. This week we are looking at how to assess digital transformation on the IBM i and we demystify the use of AI. This three-part blog series will dive into the key topics discussed within the survey: This week we discuss the Current Attitudes Towards IBM i.